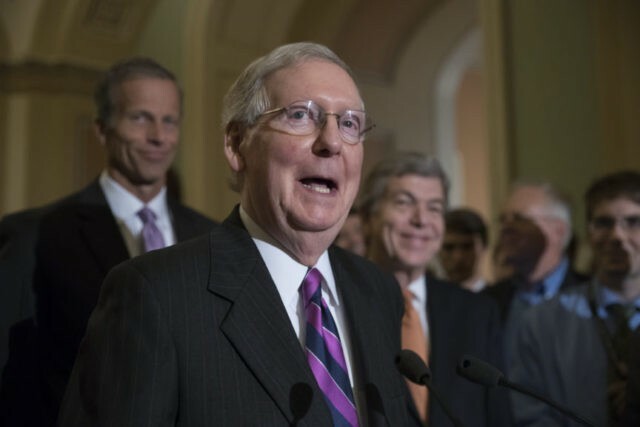 LOUISVILLE, Ky. (AP) — Senate Majority Leader Mitch McConnell says there is “zero chance” Congress will allow the country to default on its debts by voting to not increase the borrowing limit. McConnell’s comments came Monday during a joint appearance in his home state of Kentucky with U.S. Treasury Secretary Steven Mnuchin. It was one of McConnell’s first public appearances since President Donald Trump publicly criticized him for failing to pass a repeal and replacement of former President Barack Obama’s health care law. McConnell did not mention Trump in his remarks, and he did not take questions from reporters after the event. But in response to a question about where he gets his news, McConnell said he reads a variety of sources, including The New York Times. The government has enough money to pay its bills until Sept. 29. After that, Congress would have to give permission for the government to borrow more money to meet its obligations, including Social Security and interest payments. McConnell sought to calm a crowd of nervous business leaders by interjecting at the end of Mnuchin’s answer to a question about what would happen if lawmakers did not increase the borrowing limit. Addressing the country’s borrowing limit will be the most pressing issue when lawmakers return to Washington following their August recess. After that, Republicans will likely turn their attention to overhauling the nation’s tax code. On tax reform, McConnell said the only thing lawmakers won’t consider eliminating are deductions on mortgage interest and charitable deductions.